Garden Adventures - for thumbs of all colors: The NEW Begonia boliviensis - hard to spell but easy to love. 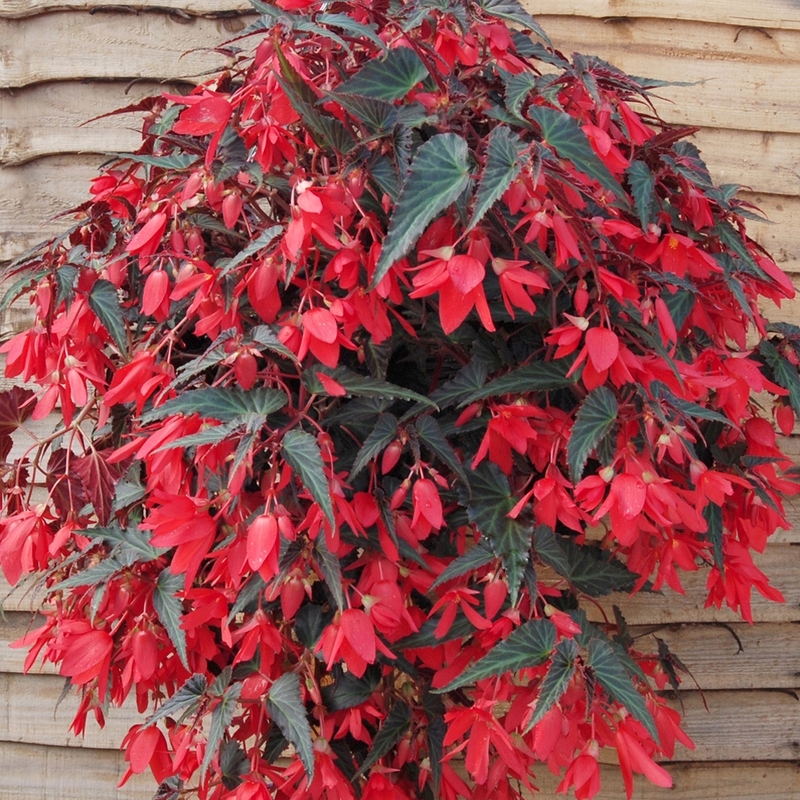 The NEW Begonia boliviensis - hard to spell but easy to love. 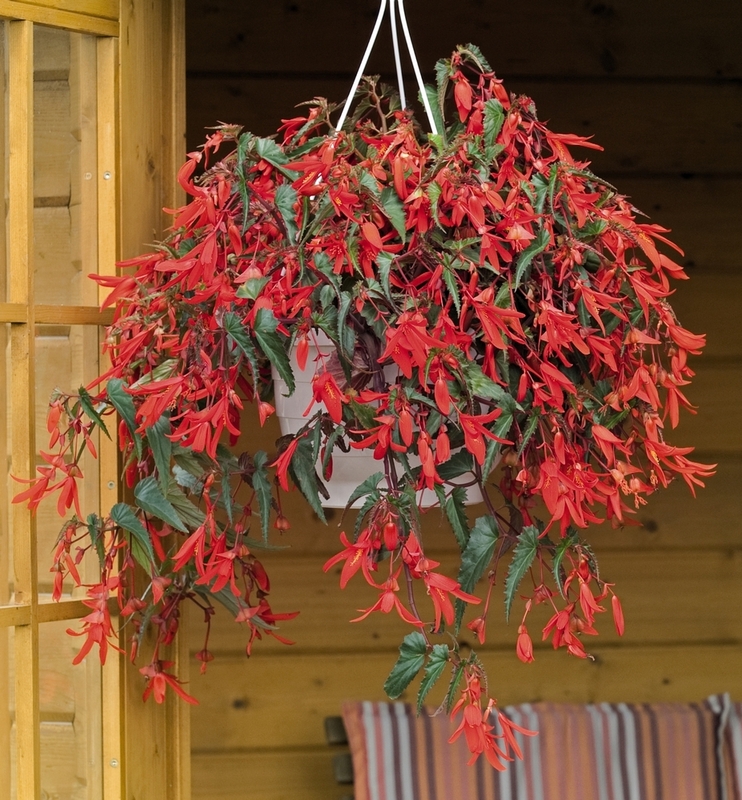 Fuchsia like flowers are the highlight of this begonia. This may seem like a strange time of year to be talking about summer annuals, but by next April we will all have forgotten what we were especially thrilled with this season or what did not work so well. Plus I have some new ones to tell you about! Every year I plant up hundreds of containers for clients as well as for our own home so I have plenty of opportunities to evaluate new varieties and combinations. 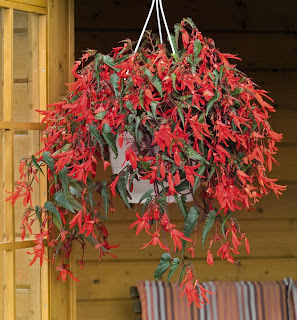 To be worthy of ‘Karen’s elite list’ each plant has to be fabulous with little or no deadheading, cope with soggy summers or hot, dry spells (by Seattle standards at least) be disease resistant and bloom its socks off for months. Yes, I place high demands on my plants! I first saw Begonia boliviensis at Heronswood Nursery in Kingston WA, home and garden nursery of renowned horticulturalist and plantsman Dan Hinkley. I was captivated by a huge container featuring the tropical looking peanut butter plant (Melianthus major). This centerpiece was surrounded with what I thought were bright orange fuchsias, exploding like fireworks as they cascaded over the sides. After discovering that this was not a fuchsia at all but a type of tuberous begonia I then wanted to be sure to remember its name. 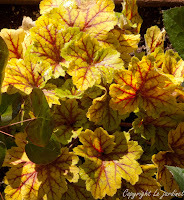 Typically I didn’t have pen and paper with me so my daughter and I kept chanting “Begonia boliviensis, begonia boliviensis….” all around the garden so we didn’t forget what it was before we could write it down! This Bolivian native is reported to be hardy to zone 7, which in theory means it should be hardy here. Somehow I doubt it. Our winters are far too wet to imagine it doing well and I don’t have time or inclination to overwinter the tubers so I’ll just have to allocate some of my annual plant budget to these beauties. Drama with 'Diamond head' elephant ears. Begonia boliviensis has become my #1 flowering summer annual for container garden design. 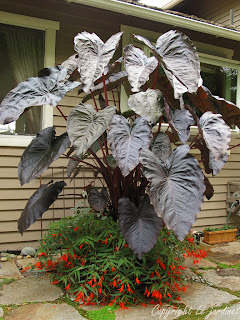 I have grown the rich orange variety ‘Bonfire’ for several years, teaming it with blue wishbone flower (Torenia) in hanging baskets, ‘Henna’ coleus and ‘Crème brulee’ Heuchera in shade containers and black ‘Diamond head’ elephant ears (Colocasia esculenta) in a fire pit which happened to be available at the time! I have even used it in full west facing exposures and it has still thrived. Each slender flower dangles like an open bell and with over a hundred blooms on a single plant it’s a siren for hummingbirds. I don’t believe you can have too much of a good thing – think chocolate for example. Or red wine. Or better still, both. 'Amour' Begonia boliviensis with gorgeous dark foliage. It is with that philosophy that I’d like to tell you about two new ‘Bonfire’ siblings. ‘Amour’ is being introduced next spring by the Ball Horticultural Company and Pan American seeds. 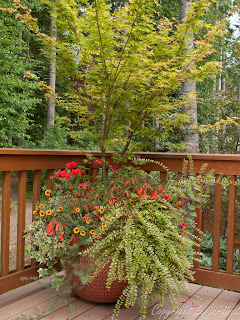 It is heralded as being the most vigorous variety yet, with deep red flowers set off handsomely against dark foliage. 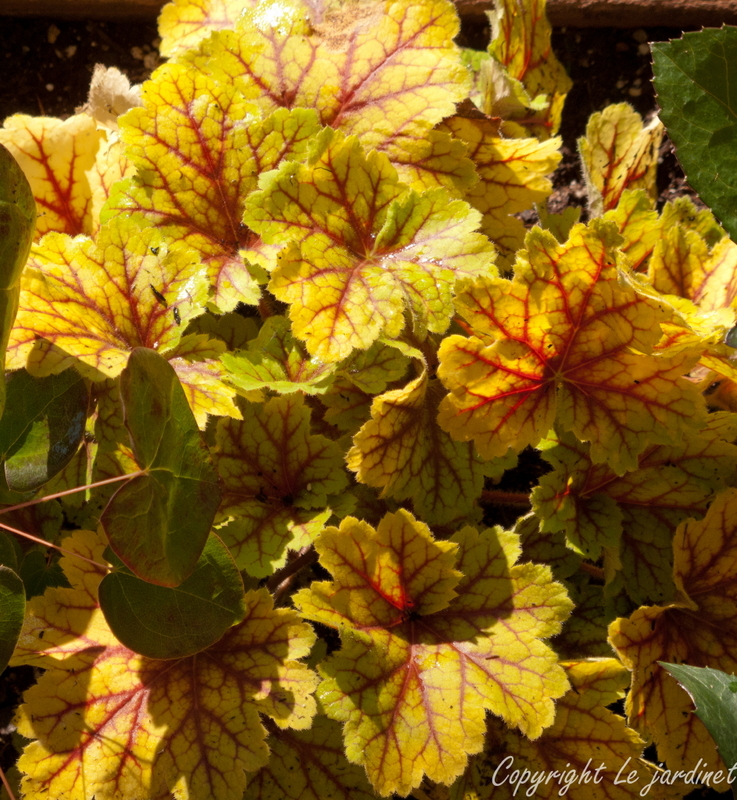 What about combining this with the perennial 'Electra' heuchera for a vivid gold and red combo in a shady container? Maybe add 'Beni kaze' Japanese forest grass (Hakonechloa macra) too? If you need something to take heat, humidity AND direct sun try ‘Santa Cruz sunset’, also being introduced in spring 2012, this time by Ernst Benary of America Inc. If ‘Bonfire’ is orange and ‘Amour is red then this combines the best of both in a fiery reddish-orange. It is so well natured it will even tolerate moderate drought – something to consider if you are a watering-challenged gardener. For a bright sunny combo I’d mix this with the heat loving ‘Samantha’ lantana which has lemon-and-lime variegated foliage and flat yellow flower heads. Or perhaps sedum ‘Angelina’ whose yellow succulent foliage takes on an orange cast as the season progresses. 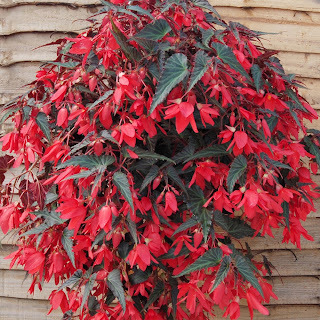 Last year I ordered 40 ‘Bonfire’ begonia plants in advance for clients who loved them. I can see this year I’ll need to gather the whole family! LOVE this plant, as you know! There are so many hybrids out there with various color variations, but the straight species and 'Bonfire' are still the best, in my opinion. Because I use it more for containers rather than bedding, I do overwinter the tubers in a cool garage like setting where they go dormant and I water them sparingly during the winter. I have colleagues that have successfully overwintered them in the ground, but as you mentioned, it's not one to rely on coming back year after year as it really does need perfect drainage over the winter. Yes this is one of our joint favorites isn't it?! So how do you overwinter them? Planted in soil but mostly dry like a fuchsia, or clean and store the tubers like Canna or dahlias to replant in spring? What impressive containers. 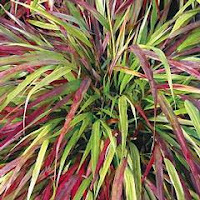 I have some of the Hakonechloa in my garden but I wouldn't have thought about using it in a container. Might have to give that a go next year. Wellywoman, I have used it in containers under Nandina, maples and compact Rhododendrons and it looks fabulous. The only problem is getting it out again as the clumps spreads just as easily in a pot as in the ground. If it s important for you to take the grass out easily I would 'double pot' it. In other words keep it in the nursery pot - or one which is slightly larger and sink that into your container garden. I know Katie - I should have measured Charlie the Colocasia each day - he grew SO fast! Hard to believe that just a pile of mounded soil in that fire pit supported such strong growth! I am not familiar with this variety...very pretty! I am going to make a note of this variety...for next year. Thanks! Sage Butterfly - be sure to post photos of your combinations! This does remind me of a fuchsia. I will definitely look for it. I wonder if it might do well in my front planter! That did cross my mind Deb - but you'll need to remember to water it! Jean that is so generous of you - thank you. I am honored to be included and so glad you are enjoying these Garden Adventures with me. Do keep in touch. I can see why you like the Begonia boliviensis. The flowers are a nice trumpet shape, such a vivid red and I even like the leaves on the plant as well. Jennifer, thanks for joining this blog and for leaving a comment. You're right the foliage is lovely - clean, elongated and succulent-like. It makes an interesting contrast to the usual summer annuals. I'm really looking forward to using 'Amour' with the dark leaves too. Hi i am new here just followed you from the most active site. These plants and flowers are all so very beautiful, i smiled when you said difficult to spell but easy to love. They are also very easy for the eyes. thanks. Welcome Andrea! 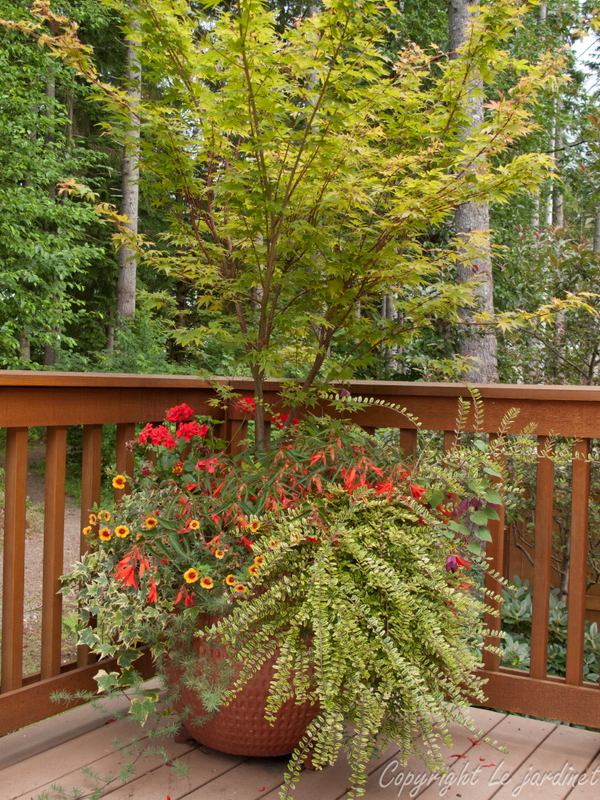 Blotanical is a great way to find other garden lovers and fun blogs isn't it? Glad the Begonia 'b' appealed to you. Can you find them where you live? Those look like knockouts, Karen! If they can handle a little more sun, I'd like to try them here. 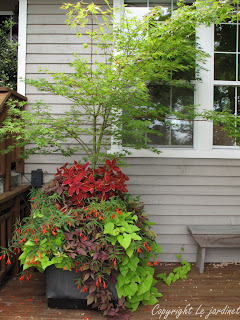 I love the combinations with the chartreuse leaves--the sedum and sweet potato vine especially! they really are Stacy. I used 'Bonfire' in extreme sun again this year and it did fine. It sounds as though Santa Cruz sunset will be equally heat tolerant. Sweet potato vine doesn't always hold up so well in hot sun. It tends to grow through wilt and recover cycles daily! The sedum Angelina would be fine though. I keep mine potted in a nursery container (6"-2 gallon depending on the size of the plant) and I keep it going as a houseplant until it stops blooming. I continue to water once a week and then they naturally just slow down and then I withhold water for a few weeks to let it die down naturally. Then I keep it in a cool, but not freezing place like a garage. I just make sure I check on it every few weeks to make sure it doesn't dry out completely. By March, I bring it indoors if I want to get it going early, but it's usually late April into May is when I bring the pots outdoors and they should begin to poke their pink eyes out of the ground and then I begin watering and fertilizing regiment for these plants. Thanks Riz-I'll try it next year, although you may have to email me every 2 weeks to remind me to check on them! !